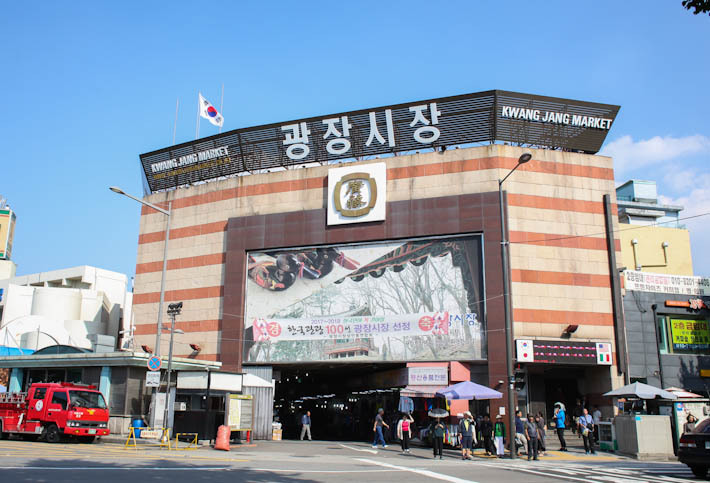 Often overshadowed by other popular counterparts such as Dongdaemun and Namdaemun, Gwangjang Market is a popular market in Seoul that is truly deserving of a special mention. 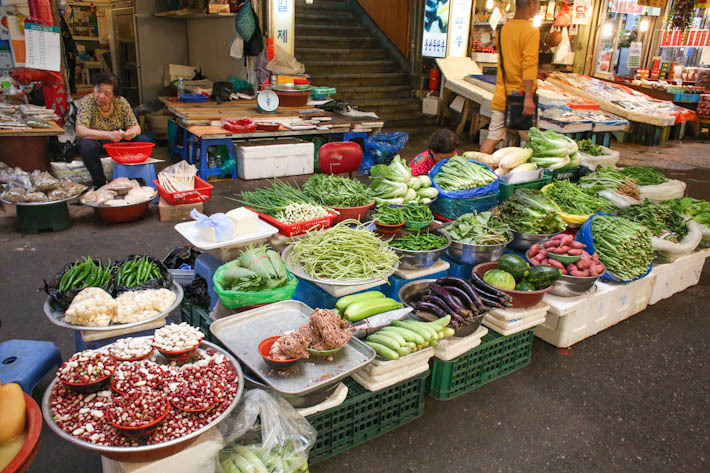 Established in 1905, Gwangjang Market is widely recognised as one of the oldest markets in Seoul. 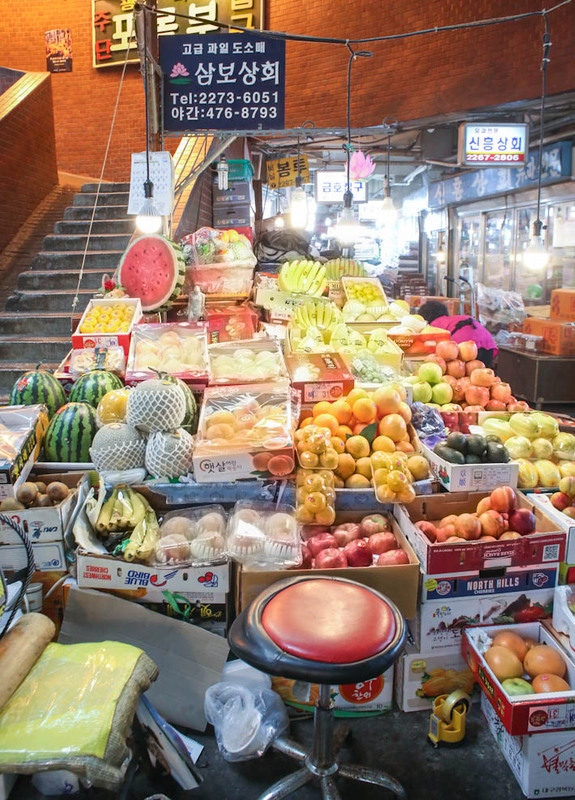 While many parts of Seoul City has evolved to accommodate western influences and ideas from abroad, Gwangjang Market has retained all of its traditional Korean roots which makes it the best place to go if you want to experience authentic Korean street food and culture under one roof. 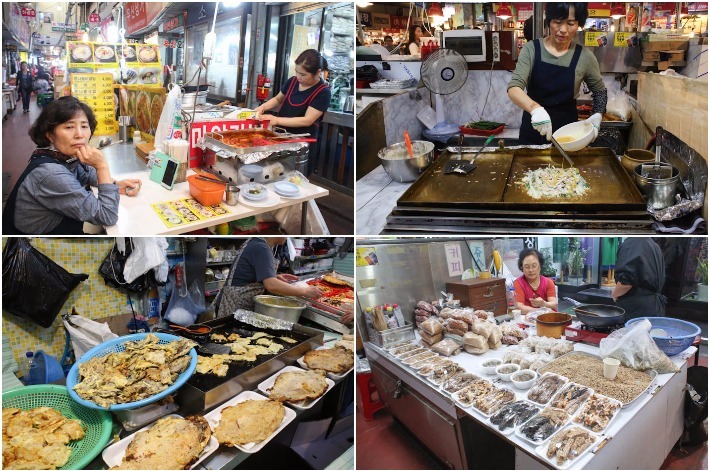 Fans of Running Man might find Gwangjang Market very familiar (watch episode 186). Not sure what you can expect there? 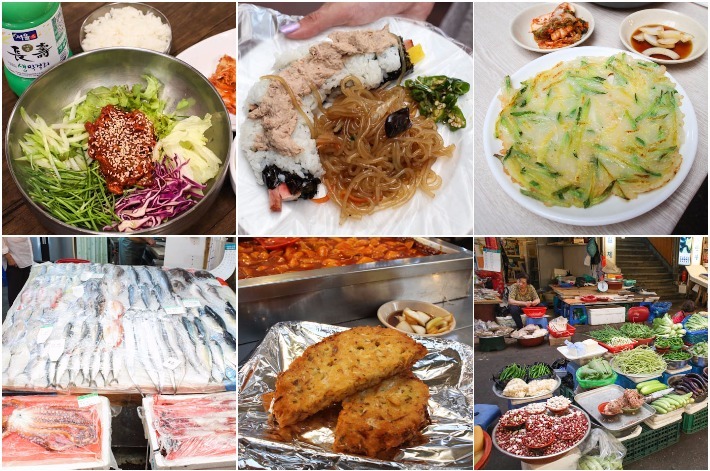 Here’s What To See And Eat At Gwangjang Market. 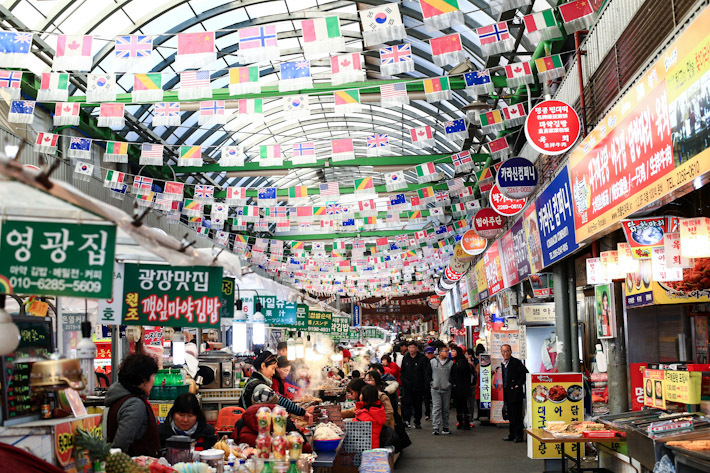 There are various sections in Gwangjang Market offering silk, clothes and food. 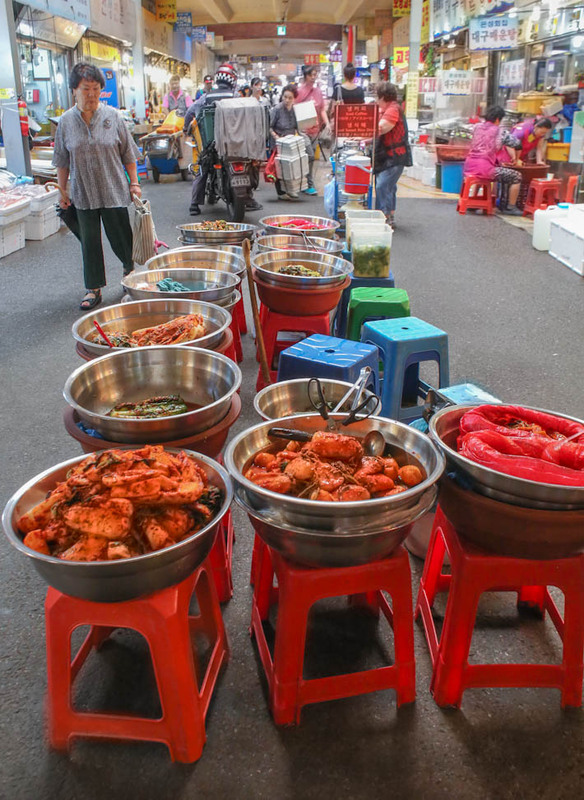 Within the food section, you will also find a variety of items on sale which include fresh vegetables, fruits, kimchi, seafood and the best of all—delicious street food! 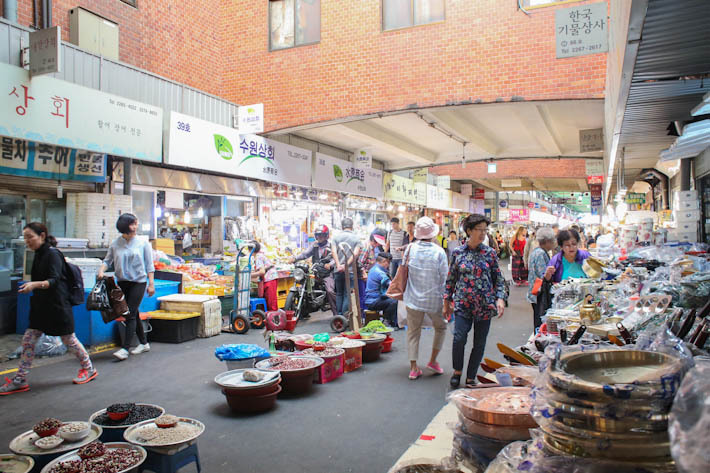 You are likely to see two groups of people at Gwangjang Market—locals going about their grocery shopping there and curious tourists wandering around the place. 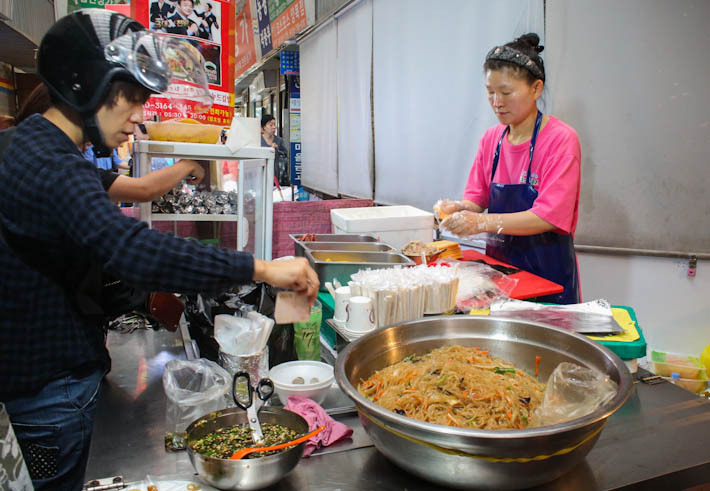 There are many makeshift stalls set up around Gwangjang Market, but the place is far from being disorganised. Basically, all the portable stalls are lined up along the centre of the walkway so visitors are required to walk either on the left or right side of the pavement. If you are not interested in fresh produce, head straight for the street food section. 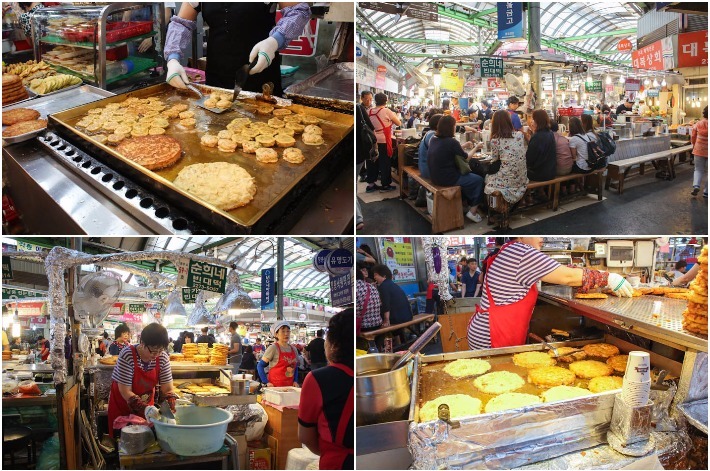 Seoul may have amazing night markets that offer plenty of street food but you definitely should not miss out on the buzzing atmosphere at Gwangjang Market. As cooking is done on-site, the first thing that will hit you is the glorious smell of street food from all the different stalls there. 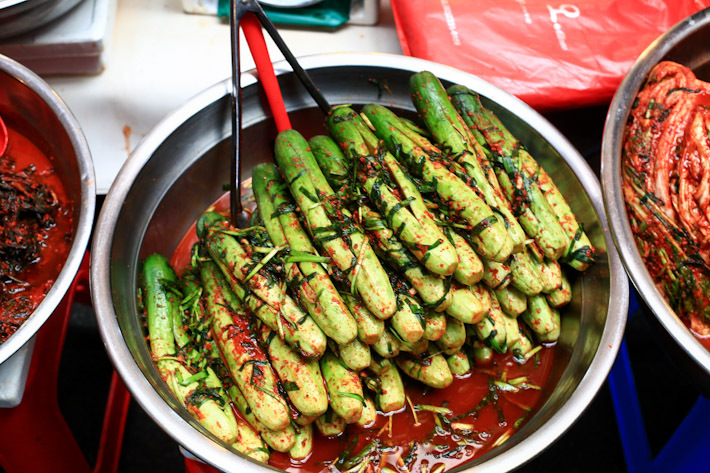 So come prepared with an empty stomach so that you can try many varieties of Korean street food! 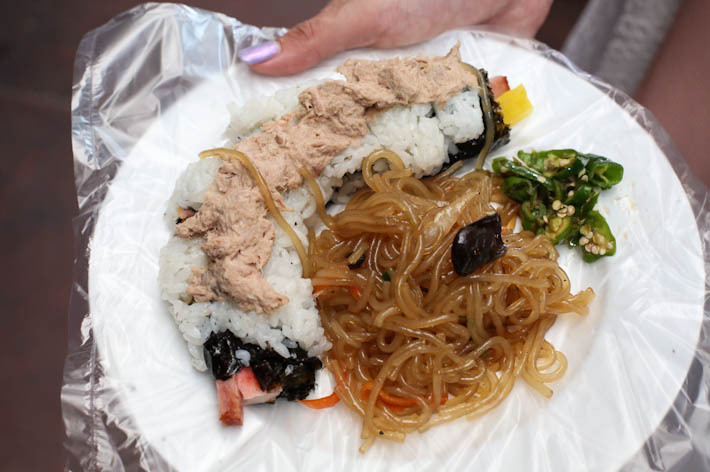 Japchae (stir-fried glass noodles) and Kimbap (seaweed rice roll) are two local favourites you really have to try. This stall in Gwangjang Market is offering a set for W2,000/ S$2.38 and we noticed that it is extremely popular among young Koreans who would pop by for a quick meal and leave. 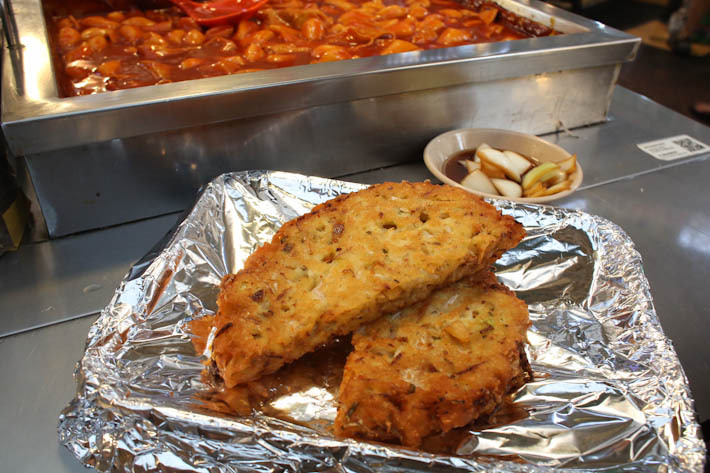 Another common dish you will find there is Pajeon (W2,000/ S$2.38). It may be a simple recipe consisting of only batter and wild green onions but you will be surprised at how the sweet and savoury flavours from the onions and pancake will create a nice balance on your palate. We were given fresh kimchi and marinated onions as sides to give the dish an extra oomph. Side dishes are refillable so that really gives you more bang for your buck. 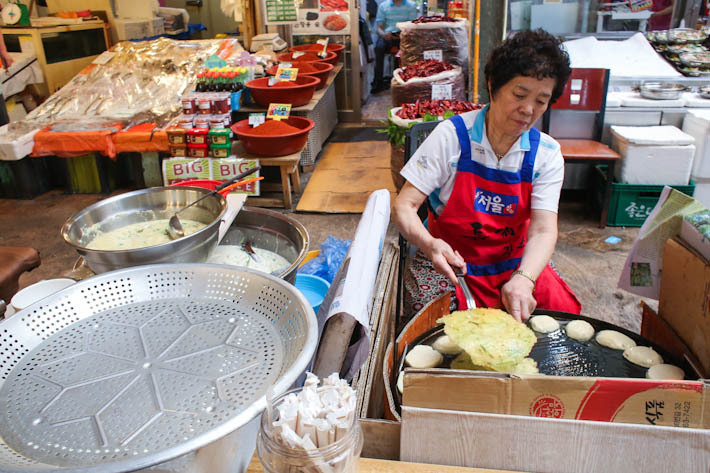 Another highlight at Gwangjang Market is Bindaetteok (W4,000/ S$4.77) which is also known as ‘Mung Bean Pancake’. 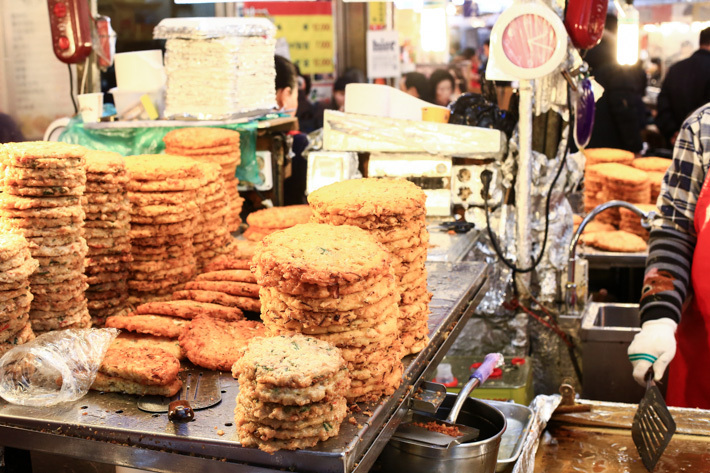 Locals make these pancakes during Korean festival celebrations such as New Years and Chuseok, so you can imagine how significant it is to them. 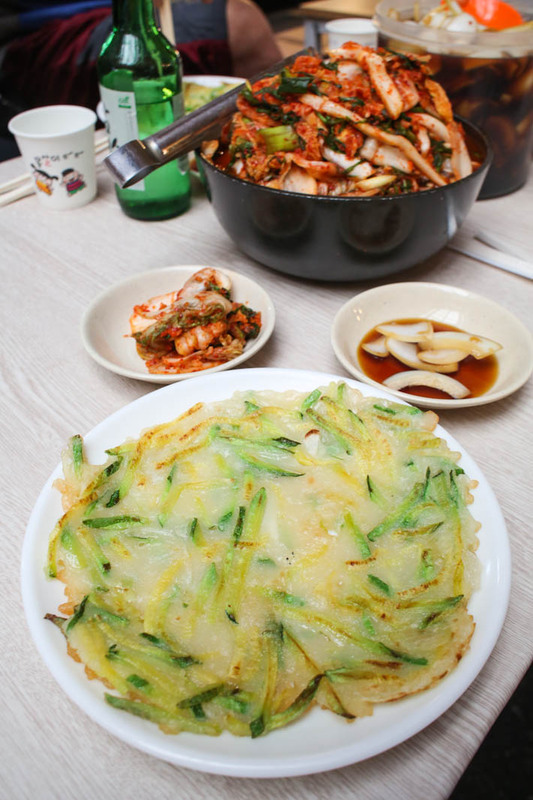 Made from ground mung beans, the pancakes are pan-fried in hot oil before they are served to you with marinated onions. Since the portion is huge, light eaters can consider sharing one so that you still have enough stomach space to try other street food there. If you are still feeling hungry after all that, go for a filling meal at one of the many casual restaurants there. 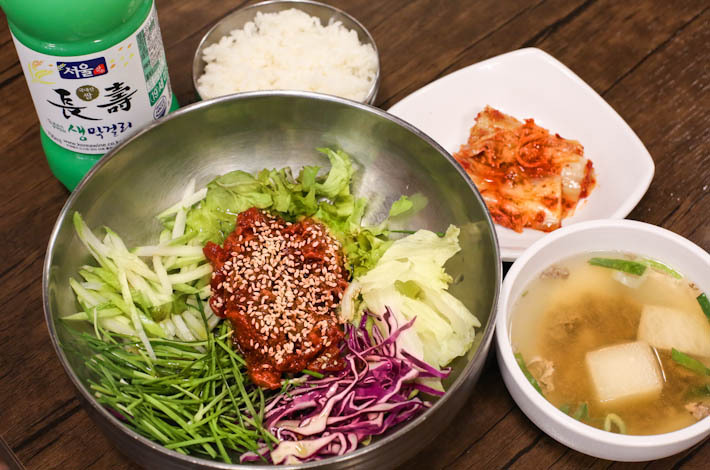 We highly recommend the Yukhoe (W8,000/ S$9.54), which is essentially bibimbap with raw beef that has been seasoned with a mixture of sauces. For an even more satisfying meal, pair it with a cup of ice-cold Makgeolli (traditional Korean rice wine) to wash it all down. For more recommendations, read our Seoul’s food and travel guides featuring the best places to visit in the city. hello!! 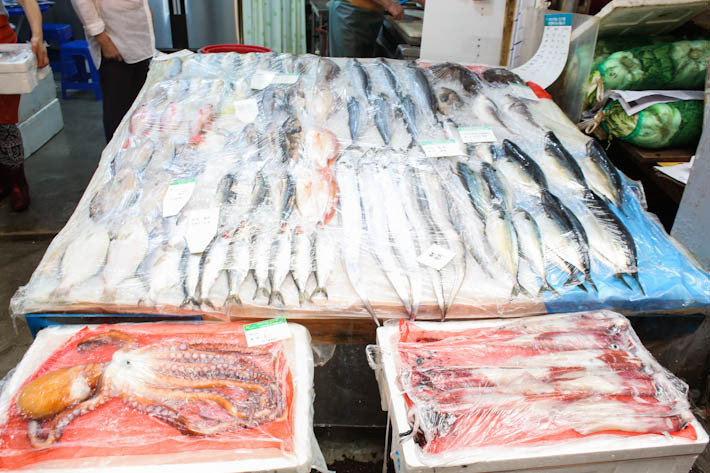 thanks for your lovely review of gwangjang market, my personal favourite is having sannakji – can’t get any fresher than if it was just alive five minutes ago and still squirming on your plate. also i would like to point out that yukhoe is actually the name for just the seasoned raw beef itself which can be ordered on its own (most often served with a raw egg yolk on top), and yukhoe bibimbap is the specific dish you are describing. cheers!